Dragon Boat - New Paddler Day! You must be a member of the Singapore Professional Singles Group to attend this activity. Would you like to join this group? Thank you for your interest in the American Dragons' New Paddler Day. What is your regular Saturday afternoon like? How is that all possible at once? 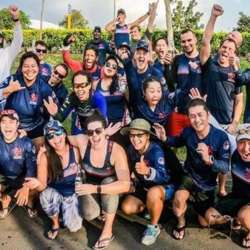 We are a competitive dragon boat team with a strong social side, and we would like to invite YOU! Afterwards we'll roll out the cooler packed with ice-cold drinks and San Miguel beers to the beach, and enjoy the view while making new friends! Now that's a Saturday afternoon! All equipment, catered food, and drinks will be provided, you will just need to bring $25.